(Sept. 22, 2003) -- A foundation created by L.A. businessman Eli Broad has chosen the Long Beach Unified School District as the best urban school district in the United States. 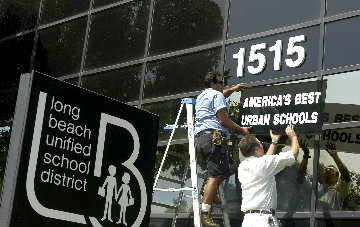 Within hours, workers hoisted a sign at LBUSD HQ proclaiming the fact. Message boards outside neighborhood schools also carried the news. The selection of LBUSD as 2003 recipient of the "Broad Prize for Urban Education" prompted LB Mayor Beverly O'Neill and LBUSD Superintendent Chris Steinhauser to fly to New York City to attend the award ceremony. Also attending were U.S. Secretary of Education Rod Paige, NYC Mayor Michael Bloomberg and NY Schools Chancellor Joel Klein. Caroline Kennedy, Chief Executive of the NY Dept. of Education's Office of Strategic Partnerships, made luncheon remarks. This award is the result of many years of hard work by all of the school district's employees, including teachers and administrators, each of whom share in this wonderful achievement. It's also a tribute, not only to Chris Steinhauser, but also to Dr. Carl Cohn, the former superintendent, who worked tirelessly to improve the education system in our community. Every staff member in our schools gives 100 percent every day, and they do it for our students. That's what’s so unique about this place...We do want to be champions of what’s right for kids. We're thrilled about this prize because it recognizes that we're an excellent school district that’s getting even better. The Broad Foundation, an L.A.-based entrepreneurial grant-making organization established in 1999 by Eli and Edythe Broad, says its mission is "to dramatically improve K-12 urban public education through better governance, management and labor relations." It said its prize is "awarded to the urban school districts making the greatest overall improvement in student achievement while at the same time reducing achievement gaps across ethnic groups and between high- and low-income students. The winning district receives $500,000 towards college scholarships or other post-secondary education..."
We offer our sincere congratulations to the 2003 winner of The Broad Prize For Urban Education -- Long Beach Unified School District...We are thrilled to honor some of the very best urban school districts in America. Broad Prize scholarships will give over 100 graduating seniors from low-income families the chance to receive a college education, an opportunity they might not otherwise have had. These students are our nation's next generation of leaders, and we are pleased to support them and their future education. 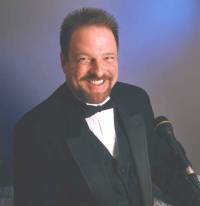 The five finalist school districts competing for the Prize in 2003 were LBUSD, Boston (MA) Public Schools, Garden Grove (CA) Unified School District, Jefferson County (Louisville KY) Public Schools and Norfolk (VA) Public Schools. This is the second year LBUSD has been a finalist. A Broad foundation release said the selection jury included Jeb Bush, Governor of Florida; Henry Cisneros, CEO of American City Vista; Phil Condit, CEO of The Boeing Company; Marian Wright Edelman, President of the Children's Defense Fund; John Engler, Former Governor of Michigan; Jim Hunt, Former Governor of North Carolina; Richard Parsons, CEO of AOL Time Warner; Hugh Price, Former President of the National Urban League; Richard Riley, Former U.S. Secretary of Education; Judith Rodin, President of The University of Pennsylvania; Andrew Stern, President of the Service Employees International Union; and Jack Welch, Former CEO of General Electric. In July 2002, the U.S. Conference of Mayors -- in which Mayor O'Neill plays a leadership role -- launched an initiative on education and announced that the Broad Foundation would be the Conference of Mayors partner in the Mayors' Initiative for Leadership in Education (MILE). In October 2002, 15 Mayors from across the country -- including Mayor O'Neill -- met in Cleveland to (in the words of a Conference of Mayors release) showcase "best practices and discuss leadership strategies" in a forum sponsored by the Conference of Mayors and the Broad Foundation. Over 100 U.S. urban school districts were identified as eligible candidates. A Review Board comprised of "20 prominent education leaders from across the country -- with the help of the National Center for Educational Accountability (NCEA) -- analyzed extensive quantitative data and used their collective knowledge and experience to determine the finalists." Under NCEA's guidance, "a team of researchers and practitioners conducted extensive site visits to each finalist district to gather additional quantitative and qualitative data, and met with each district's school board, superintendent and union leaders." The Selection Jury reviewed the information collected on the site visits and information considered by the Review Board to select one district as winner of the Broad Prize for Urban Education. In its release, LBUSD says that during the evaluation process, a team of researchers visited Tucker Elementary School, Hill Classical Middle School and Wilson Classical High School, which along with nearby Poly High School was recently ranked by Newsweek as one of the top high schools in the nation. "You are pillars of hope for other school districts," LBUSD's release quotes independent evaluator Jean Rutherford as saying during her visit to LB schools. "You prove it can be done." The Long Beach Unified School District, with 97,000 students, is the third largest school district in California. The fact that the prize went to a California school district is especially noteworthy considering the state’s record budget deficit and reduced school funding over the past two years. As a result of state budget cuts, the Long Beach district has eliminated $40 million from its budget by freezing the hiring of non-teaching positions and implementing other cost-cutting measures. By using reserves and controlling costs, the district has protected classroom instruction, maintained class size reduction and averted the demoralizing layoffs felt by many other California school districts. Regain the American public's confidence in public schools by spotlighting districts making gains in student achievement. Create an incentive to dramatically increase student achievement in the nation's largest urban school districts. Reward public school systems that are successfully using creative, results-oriented approaches and techniques to better educate children. The release added that in addition to the $1 million award, the finalist districts of The Broad Prize for Urban Education "will be showcased nationwide over the following year. These school districts' best instruction and management practices will be spotlighted so that other urban school systems can learn about and adopt successful practices." To those of us not satisfied with the quality of K-12 education, there are three schools of thought. The first group believes in vouchers. People who advocate vouchers believe that market forces will cure all ills. I oppose the large-scale use of publicly funded vouchers. The second group believes in competition. Charter schools, private schools, Edison schools, parochial schools and opportunity scholarships all provide healthy competition to our K-12 public school system. I support rapidly increasing the number of seats available outside of our public school system. Healthy competition has raised the quality of higher education in the United States, which is viewed as having the best higher education system in the world. No one can say that higher education is a tired government monopoly. Although I support many forms of public school competition, I believe these programs simply cannot grow at the pace and scale necessary to meet the needs of children in the 21st century. Over the next decade, four out of five children in America will continue to be educated in public schools. The Broad Foundation's mission is to dramatically improve K-12 urban public education through better governance, management and labor relations. These are essential, often overlooked, elements in American education that will lead to higher academic achievement for all students and to greater economic opportunities for the next generation.